Below, guest blogger, John Carbona gives us his account (including pictures) of Day 2 of the Vatican Stem Cell Meeting, which included a talk by Nobel Laureate John Gurdon. Note, you can read John’s post on Day 1 of the meeting including more great pictures here. Last night was a magical evening for this former altar boy and parochial school kid from Long Island. We were treated to a short walk through the Vatican gardens and the Vatican Museum where we congratulated Dr. Ed Bosarge (see below left in picture) for his incredible financial contributions to the Stem for Life Foundation. A yacht owner and competitive sailor, Dr. Bosarge began his career at IBM working on the flight control systems for the NASA Saturn 1-B and Saturn V programs, and later on quantitative analysis of financial markets. He also served as a math faculty member at Rice University from 1969-1972. In 1986, Dr. Bosarge founded The Frontier Companies where he further developed predictive financial market technologies for automated trading. Last night he was awarded the Key Humanitarian Award. Before I get into today’s highlights, I must give a special thanks to NeoStem and its multitalented CEO, Dr. Robin Smith, whose fingerprints are all over this conference. She is one heck of a lady and knows how to stage an event. It’s an amazing conference. Thank you, Dr. Smith. (editor’s note, you can read my interview with Dr. Smith on stem cells including NeoStem’s work with the Vatican here: Part 1 and Part2). Today we were welcomed to the meeting by news anchor, Bill Hemmer (Fox). We listened to Tommy G. Thompson, former Wisconsin governor and U.S. Health & Human Services Secretary under George W. Bush. He introduced the best presidential speechwriter of all time, Peggy Noonan; former U.S. Senator, Norm Coleman; former member of the President’s Council of Bioethics, William Hurlburt; and Dr. Chris Mason from University College London (see image below). Thompson said seed money for American bio start-ups is available from Barda and NIH. A robust discussion about embryonic versus adult stem cells ensued. In the United Kingdom, embryonic cell research is occurring on embryos less than 14 days old. In fact, most cells are used within 3-5 days of fertilization, which is before the brain and central nervous system are formed. 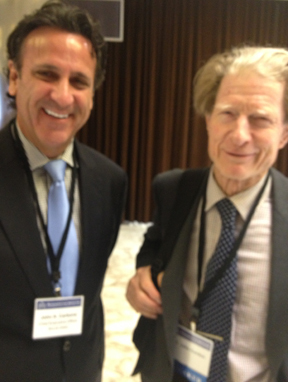 The next speaker was Sir John Gurdon, 2012 co-recipient of the Nobel Prize for IPS work. Marcelo Sanchez Sorondo, Chancellor of the Pontifical Academy of Science, presented Sir Gurdon the Key Scientific Award. Gurdon stressed that all stem cells make two daughters, one which lives and dies, and one which makes another stem cell. He pointed out that, contrary to hyped media reports, nucleic transfer cannot be replicated in humans today and so no cloning of humans is possible at this time. He showed a compelling video of skin cells harvested from a monkey that were reprogrammed to become a mass of beating myocardial cells. He did point out that the obvious approach would be to transplant these back into an injured monkey. However, the problem is that the heartbeat frequencies didn’t match each other. He believes, in time, this could be solved. Sir Gurdon envisions future stem cell research will lead to a day when a disease could be replicated in vitro and new drugs could be tested before actually going into patients—saving billions of dollars and time-to-market for new drugs. He concluded by stating that he felt the eye would be the first area with commercial patients using stem cells. See picture below left of John Carbona with John Gurdon. Very cool. Then, we met a young boy named Ciaran Finn-Lynch who received the Pontifical Hero Award. Ciaran was the first patient to receive a stem-cell-seeded trachea transplant from his bone marrow. Next, we heard from American stem cell pioneer and surgeon, Dr. Christopher J. Centeno, who has performed more than 4,000 patient mesenchymal stem cell treatments for orthopedic patients and has over 20 Regenexx locations treating patients. Organogenesis presented Apligraf®, a human skin product, using stem cells produced in 20 days for treating chronic wounds. This product is effective in healing wounds previously unresponsive to treatment, and also increases the speed of healing. Will new Pope Francis (Jorge Mario Bergoglio) cancel upcoming Vatican stem cell meeting? 1. Eye is not the first indication where commercial stem cell products will be applied, because there is a number of them approved on the market already for different diseases – heart attack, GVHD, cartilage repair, bone repair…. Unless he meant embryonic stem cell-based products. 3. Apligraf of Organogenesis is not a stem cell product. It does not contain stem cells. Also, a number of other companies, participating in the meeting were called “stem cell companies”, example – Opexa (does T-cells). The case when all companies, dealing with cells, called “stem cell companies” is a huge misinformation of public.